Domestic Vacations—the very title of photographer Julie Blackmon’s most recent series offers us a whimsical contradiction. The photographs in the series are equally whimsical and equally contradictory. In a way, these images are classic interior photographs; still, composed, quiet. In a way, these images are classic child portraits. And in a way, these images are in the style of classic renaissance Dutch painters such as Jan Steen and Vermeer. They are, in fact, the conflation of fantasy and fact, a prettified…almost surreal…version of real life. 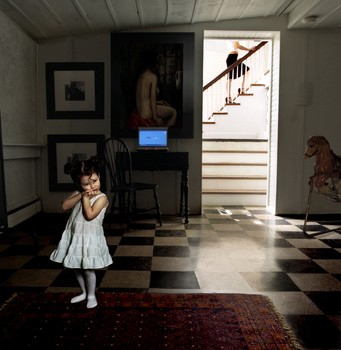 Julie Blackmon (born in Springfield, MO in 1966) is the oldest of nine children and the mother of three (two girls and a boy). Her subjects are her family and she treats her photography with the same care, consideration and discipline with which she treats her family. Using a medium format Hasselblad, Blackmon carefully arranges the elements of the image to emulate a renaissance perspective. She adds some aspects of modern domesticity and finally drops in the most vital and chaotic facets of the photograph: children. It’s that delicate balance between domestic order and domestic chaos that intrigues Blackmon and informs her art. "I believe there are little sanctuaries that can be found throughout any given day, no matter how ordinary, that reveal meaning. It is in finding these moments amidst the stress of everyday that my life as a mother parallels my work as an artist." Blackmon dropped out of Missouri State University to get married and raise a family. She took what she calls "the usual photographs" of her children, but it wasn’t quite enough. "I wanted to take some pictures of the kids, and I wanted to get some technique." She returned to college after the birth of her third child, where her eye and technique caught the attention of her instructor. With his encouragement, she began to shoot differently, with a mind toward exhibition rather than documentation. And it worked. She garnered attention first from local galleries, then from prominent galleries in Boston, L.A. and Santa Fe. Her work began to appear in photographic magazines. National Geographic has asked her to participate in a book on digital photography. The attention, she says, only adds to the unreality; it’s difficult to think of oneself as an artist when you’re picking up the Legos your child left in the hallway. The equilibrium between the highly orchestrated settings and the inclusion of living subjects—especially children—gives Blackmon’s work a dynamic quality. One feels that the scene is poised on the edge of tranquility or pandemonium; in the next instant some trivial incident could immediately and loudly disrupt the entire household. Or perhaps everybody will settle in for a nice nap. Julie Blackmon’s worlds—her real life world and the world of her photographs—’re full of possibilities. And that makes them exciting.